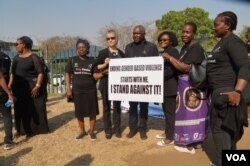 Women's rights activists in Malawi's capital, Lilongwe, braved hot weather Thursday to protest recent domestic violence in which seven women were slain or disfigured by their partners. 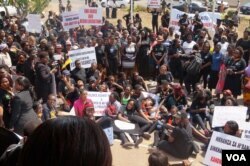 The protesters, many of them women, wore black attire, and at one point they lay in the street to symbolize mourning. They carried banners and placards that read: "Violence against women is an offense, not a private issue," "Ending gender violence starts with me, I stand against it;" and "Don't be silent, speak up against intimate partners' violence." Emma Kaliya, national coordinator for an NGO called Gender Coordination Network, an umbrella body of women's rights organizations in Malawi, told VOA that domestic violence is not an isolated occurrence in Malawi, but what is most worrying is the form it now has taken. "Maybe in the old days, we used to know the beating, maybe the shouting, and also maybe stalking," she said. "But now we are seeing a different one, where people are literally using small arms to harm others. Like, they are using guns, they are using knives, stabbing women, or literally using an ax." Incidents that triggered the protests included the death of a young mother who was killed by her husband in southern Malawi for refusing to open the door for him when he returned from from a night of drinking; and deep cuts on the face a police officer's wife in Lilongwe, who was beaten by her husband because he suspected her of dating another man. And there was the tragic death of Miriam Siula, 30, who was stabbed with a knife by her ex-boyfriend in Lilongwe after she ended the relationship. Siula's relatives on Thursday gave the marchers graphic details of how her ex-boyfriend, now charged with murder, stabbed her three times in the chest and stomach while her helpless mother was watching. Marcel Chisi, national chairman of Men for Gender Equality Now, a male-dominated NGO that works to stop violence against women, told VOA that men are sometimes driven to commit domestic violence because of the entrenched patriarchal nature of Malawi society, in which men regard themselves as decision-makers on behalf of women. "And I think the more women are getting empowered and are beginning to question [some decisions by men], you know, [in a] very honorable way of questioning," he said. Chisi said ongoing sensitization meetings by women's rights campaigners on the subject have resulted in more women reporting violent incidents to law enforcement agencies for action. National Police spokesman James Kadadzera agreed. "We do receive cases of domestic violence on a daily basis in all our police stations across the country," he said. "It may seem that numbers are increasing, [but it's] just because there is that sensitization to members of the public, and they quickly come to police and they report." Statistics by the Ministry of Gender show that 53 percent of married women report their current husbands as the perpetrators of the violence they face. But Kadadzera said many women withdraw cases involving their husbands because of fears of financial insecurity, and that allows many perpetrators to escape punishment. Domestic violence in Malawi is an offense punishable by a maximum sentence of 14 years in prison. Legal experts say some women fail to report domestic violence cases largely because of the high illiteracy rate among women, currently at 71 percent. The Women Lawyers Association of Malawi has offered to provide free legal assistance to female victims of domestic violence. Sarai Chisala-Templehoff, national chairwoman of the association, said, "We have received over 10 cases — almost always, physical violence is involved. One woman's house was burned down entirely, and other family of the ex-husband sold the house they used to stay in." Several current cases, she added, involve battery. Chisala-Templehoff said the services provided by her organization include legal representation, litigation and referrals. In a petition, the protesters demanded that government institutions fire any public officer who engaged in any form of violence against women. 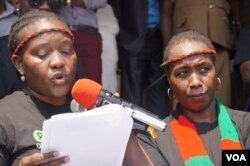 They also called upon Malawi President Peter Mutharika "as a champion and ambassador for the HeForShe campaign," to issue a statement to condemn violence in all its forms. HeForShe is a campaign for women's advancement, initiated by the U.N. Entity for Gender Equality and the Empowerment of Women, also known as UN Women. It seeks to make men and boys agents of change, urging them to act against the inequality women and girls face. Deputy Minister of Gender Clement Mukumbwa received the protesters' petition and promised that the government would look into all issues raised.